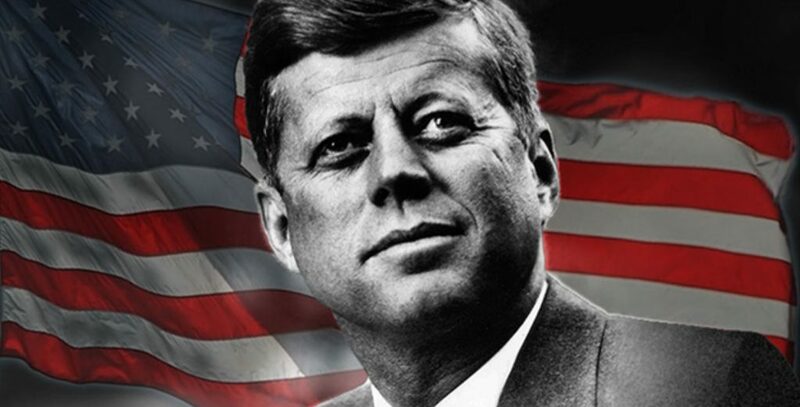 On Thursday, much to the chagrin of anyone seeking transparency, the US government released 2,800 previously classified files relating to the assassination of John F Kennedy while holding back several hundred more. President Donald Trump delayed the release of the others, saying he had “no choice” but to consider “national security, law enforcement, and foreign affairs concerns” raised mostly by the FBI and CIA. As TFTP predicted, the JFK files were no smoking gun. 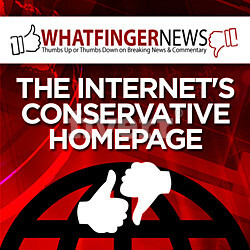 However, many of the documents contained in them reveal and confirm the absolutely horrifying practices of the world’s most insidious spying agency. In an amazing act of citizen journalism, Thursday night, the internet pored over the documents, including all of our staff here at TFTP. The information gleaned from these previously Top Secret documents reveals the dark truth about the CIA’s covert, murderous, criminal, and outright terroristic workings. From mind control to media control to working with the mafia and using covert chemical weapons to starve innocent civilians, the CIA has operated in the shadows breaking international law and laying waste to anyone who gets in their way. 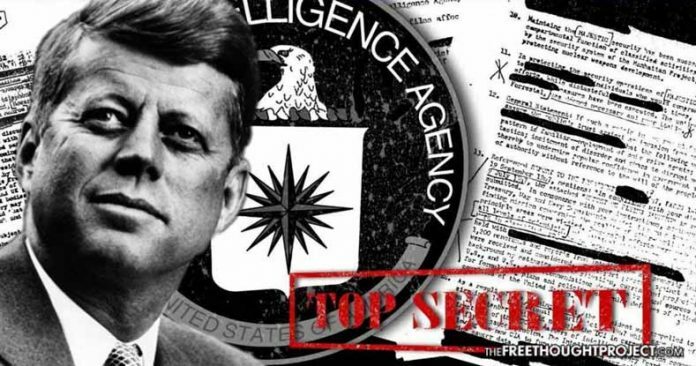 The Free Thought Project has put together a list of documents retrieved from the JFK files detailing these outright ominous practices by the CIA. 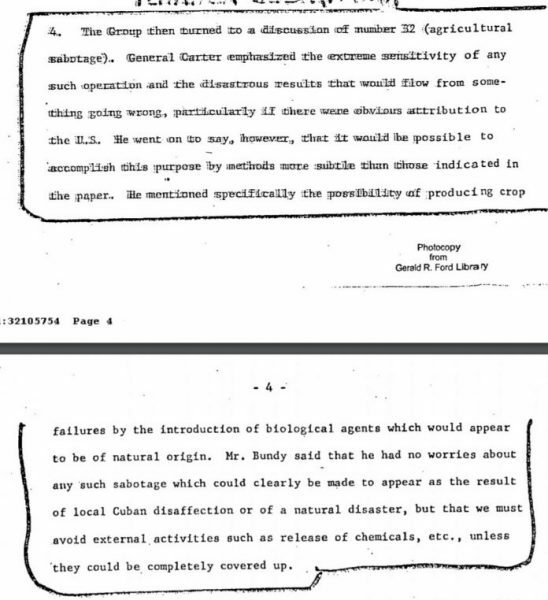 In the minutes of a meeting for Operation Mongoose, the group discussed using ‘agricultural sabotage’ to terrorize the Cuban people and effectively starve an entire country. While the CIA expressed concern over the operation, the concern was not about innocent human lives, only about getting caught. 2. The CIA is a terrorist organization that not only encouraged terrorism and murder but openly funded it. 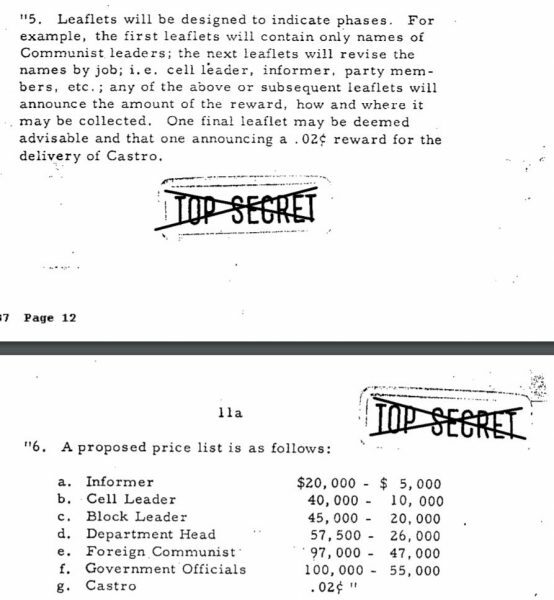 The CIA actually created a hitlist menu of sorts with bounties listed for the murder of certain individuals. These same tactics were put to use in Afghanistan which led to citizens turning in other innocent citizens just to receive a reward. Indeed, Gitmo was filled due to a very similar approach. On the first page of the archives were two glaring documents which were apparently ‘unmarked’ but quickly deemed Top Secret once the information was noted inside them. 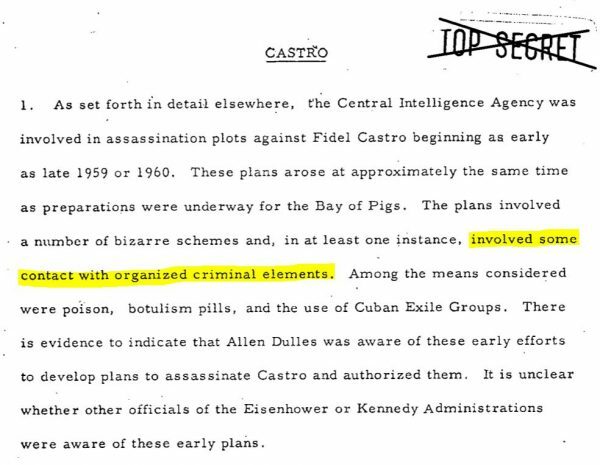 In the document, the CIA details various assassination plots against Fidel Castro beginning as early as the late 50s. According to the CIA, the “plans involved a number of bizarre schemes and, in at least one instance, involved some contact with organized criminal elements.” One of these contacts was the notorious Chicago mob boss, Salvatore “Mooney Sam” Giancana. In one of the more ominous documents, titled Commission on CIA Activities within the United States the CIA admits to numerous campaigns of propaganda and public deception. For those familiar with the CIA’s MK Ultra program, the above-mentioned techniques are shockingly telling, to say the least. Even when the CIA released its massive archive last year, the tens of thousands of pages contained almost no information on the CIA’s program to control the narrative in the media, otherwise known as Operation Mockingbird. 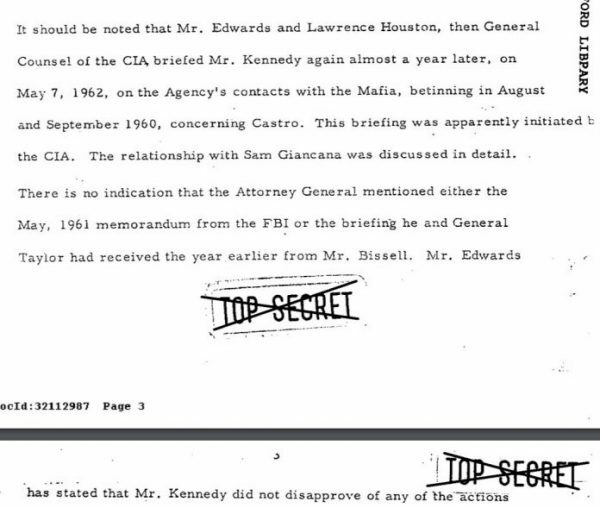 However, in two separate documents within the JFK files, the CIA admits to the program and a Congressman confirms that he is worried about their influence. 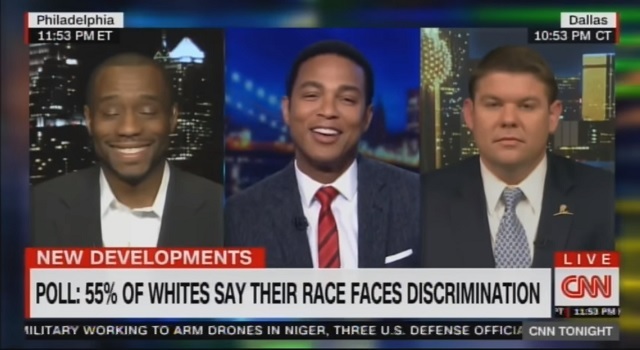 In regard to what Congressman Walter E. Fauntroy was talking about at that time, the above-mentioned document, titled Commission on CIA Activities within the United States, may provide that answer—Operation Mockingbird. As TFTP predicted, so far, these documents change very little on the ‘official story’ of how JFK was killed. However, they provide a glimpse into the agency who admittedly works with crime lords to kill heads of state. They expose programs of thought manipulation and “brain working.” The documents don’t tell us that it wasn’t Oswald, but they do tell us that the CIA was capable of killing anyone, anywhere, and making it look like an accident. If this secret and unscrupulous organization was conducting operations 50 years ago, like the ones listed above, we can only imagine how much worse they have gotten since then. Perhaps, one of the most important factors to consider in this torrent of information is that the very release of these documents could be part of this most unscrupulous practice of propaganda and mind control. Indeed, the ‘mockingbirds’ in the mainstream media are already using the release of these documents to bash anyone who questions the official story.